Wow! What a brilliant start to our time away! We set off at 9.45am from school with a sense of excitement and anticipation (and some nerves!). The coach journey went really well, give or take a leaky flask, and we unloaded our luggage when we arrived. Matt took us on a tour of Charterhouse and told us all the things we needed to know. Mrs Rowe gave us our rooms and showed us where the staff would be sleeping. She is right in the middle of ALL the rooms, so she can keep an eye on everyone! We were told that someone would be on duty each night if we needed an adult. The rooms are really comfortable, with big bunk beds and lots of cupboard space thankfully. "It's really nice to share with friends!" 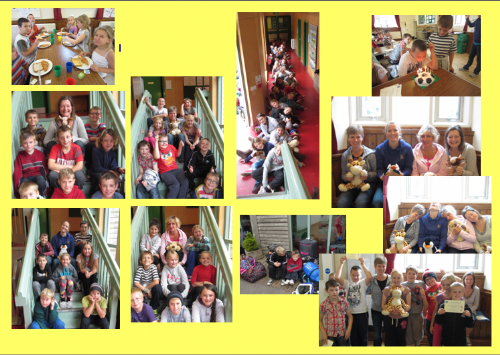 Next, Mrs Rowe gave us our teams for the week, and our mascots!! The mascots have to do EVERY activity with us, as a full member of the team. They can earn us (or lose us) points. It is our joint responsibility to make sure they are alright! The team games were brilliant this afternoon. Andy gave us five different activities to complete. We all got better as we went along. The Penguins were the winners of the 'Dog and Bone', and the Dogs won overall. Of course, the mascots had to join in! After a great dinner of fish fingers and chips, we went on our nightwalk. We finished the day with hot chocolate and marshmallows! After a pretty good night, we awoke to the smell of bacon and baked beans. We had a hearty breakfast and then met for our first activities. The Penguins were the first group to brave the caves, squeezing through gaps and climbing over rocks in the blackness. 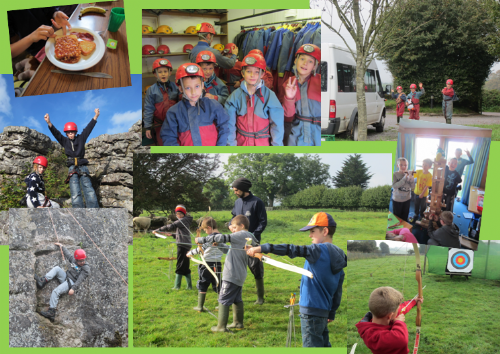 The Dogs started with climbing, the Cows with archery and the Giraffes had enormous success pond dipping. They found a rare newt and 'Steve' the Stickleback fish! Lunch (and Birthday Cake!) was well-earned and eaten quickly, then it was time for round two of the activities. The Dogs went off to build shelters in the woods, while the Giraffes climbed. 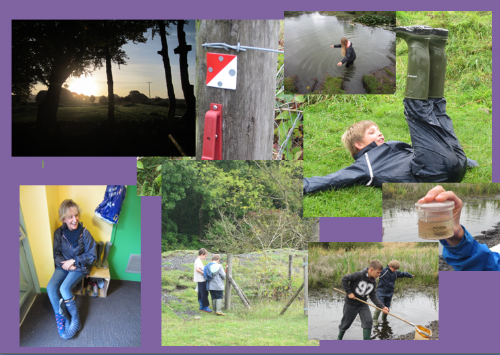 The Cows tried to match the success from the morning pond dipping, while the Penguins competed at archery. In the evening, we competed in our teams at a scavenger hunt, finding weird and wonderful objects from around the grounds of Charterhouse. A quick quiz, hot chocolate and marshmallows, and a bedtime story, and everyone was ready for bed! What a beautiful morning at Charterhouse. Another fantastic breakfast and we were ready for orienteering with Andy and Matt. We assembled in the hall to be briefed on the challenge ahead of us. This was another opportunity to earn some team points by using our map reading skills. Under the watchful eyes of the staff, we were let loose in the nature reserve to find controls. The Penguins were the champions by a whisker! After lunch, Mrs Cooper braved the caves with the Dogs, Ms Harvey took the Giraffes to build shelters in the woods (campfire included! 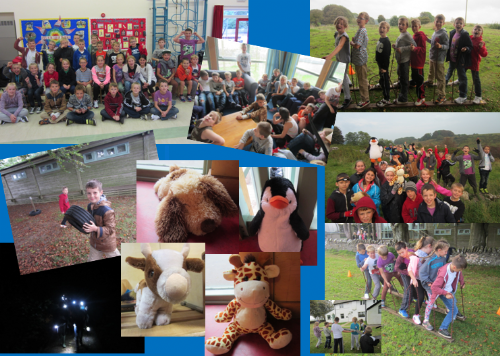 ), the Penguins dipped in the pond with Mrs Rowe, and Mrs Bayfield scaled the dizzy heights of the climbing wall with the Giraffes. Chicken curry and rice, followed by trifle, filled a hole in our tummies before we attempted to launch pilots (aka eggs) in home-made rockets for our evening activity. This morning was a slightly later start because we are all so tired! Bacon, egg and beans for breakfast set us up for the day's activities. Penguins climbed the dizzy heights of the cliff face- even Mrs Rowe reached the top. There was a rescue mission for Megan's trainer when it became lodged in the wall! (Thanks Matt). Mrs Bayfield's Cows built shelters in the depths of the woods, with Andy and Andy! Ms Harvey's Giraffes began the day under the ground, exploring tunnels. Mrs Cooper's Dogs became Robin Hood for the morning. A slightly later than planned lunch saw the arrival of an important visitor- Mr Jones! We were all pleased to see him and he stayed to watch the afternoon's events unfold. The concluding activities meant that the Cows went underground, the Giraffes shot arrows with bows, the Penguins (and Mr Jones!) 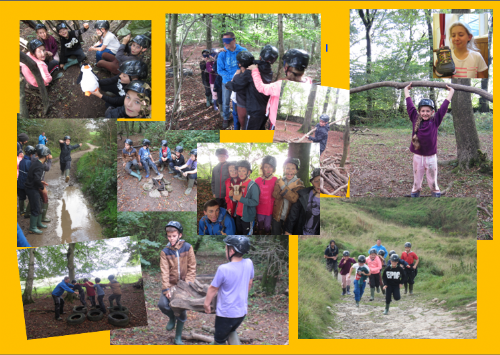 were attacked by "naughty squirrels" in the wood, who distracted blindfolded members of the team with grass, leaves and the occasional spot of rain! Finally, the Dogs tried their luck at finding fish and bugs in the ponds. What could be better than pasta bolognaise, garlic bread and chocolate pudding to round it off? The Charterhouse has Talent Competition. Let the entertainment begin! Croissants for breakfast- Ms Harvey was very happy! After a monumental effort to pack up all our belongings and tidy the rooms, we were finally ready for the Charterhouse Award Ceremony. Blackbird Pot won the room award, while the Giraffes took first prize for the team points over the week. Every child had an individual award, and the Charterhouse Star Award went to Larissa for her outstanding attitude and teamwork throughout. Kyle enjoyed blowing out the candles on his Birthday cake, and we all set off for one final activity, orienteering around the grounds. It has been a blast! Goodbye Charterhouse 2014! "I would like to take the opportunity to say thank you to the children for being such wonderful sports, and how proud I am for their great attitudes and behaviour throughout the week. It has been a pleasure to bring them away and they have done St John's School proud. Also thanks to my amazing team- Mrs Bayfield, Mrs Cooper and Ms Harvey, without whom this week could not have happened. Thank you for giving up your time and energy!" Don't forget, we return at 2.30pm!